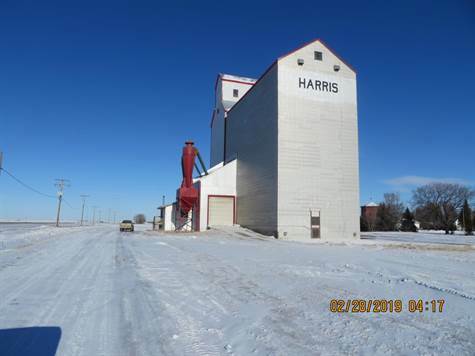 This is an opportunity to buy the Harris elevator on CN lease located beside rail line and adjacent to Hwy.#7. The elevator has storage capacity of approximately 48,000 bus and the annex for 88,000 bushels. Total storage is approximately 136,000 bushels. The owner feels the storage capacity is in the 150,000 bushel range. There is an existing concrete pad that new steel storage could be added to the system. The elevator has an office with ¾ bath. The lease has its own well and septic tank. It is heated with natural gas furnace which needs to be replaced. The hot water heater is natural gas, also. Elevator has 34 ft. digital scale- 40 tonne capacity plus back hopper with beam scale. In addition, there is indent grain cleaner that was recently rebuilt. The leg has capacity of approximately 3600 bushel per hour with newer belt with plastic cups. The elevator has overhead doors on both end of the drive entrances. The car puller is still in place. The elevator has been completely re-tinned very recently. The lease is subject to CN approval plus assumption fee of $500.00 plus a letter of credit for $125,000.00 and $1 million in liability coverage. Utilities with current usage run approximately $200.00 per month. The current lease is $1,650.00 per year plus gst. Terms have been 5 year intervals. The current lease term ends on Aug. 31st, 2021 to be renewed Sept.1, 2021.